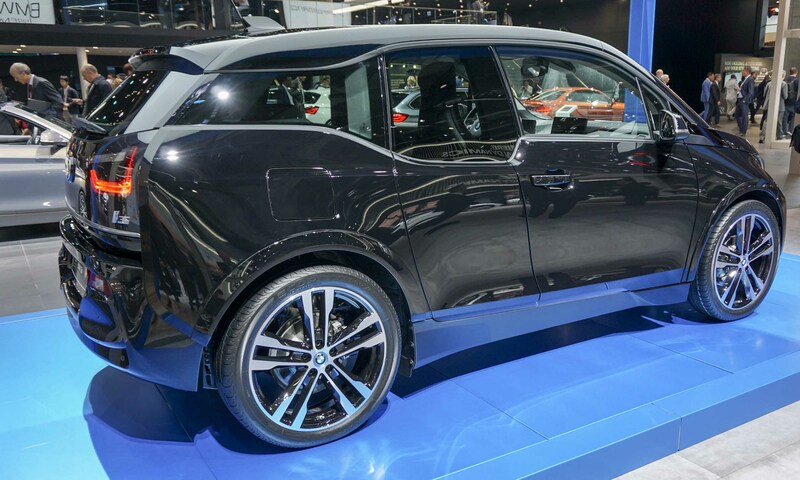 BMW debuted two concept vehicles at the International Motor Show in Frankfurt that embolden the existing model lineup: the BMW Concept X7 iPerformance that tops the X line, and the BMW i Vision Dynamics, a 4-door all-electric vehicle that would slot between the current i3 and i8 models. BMW also debuted two new 2018 models: the i3 that now includes a i3s sport version, and the all-new sixth-generation M5 sport sedan. 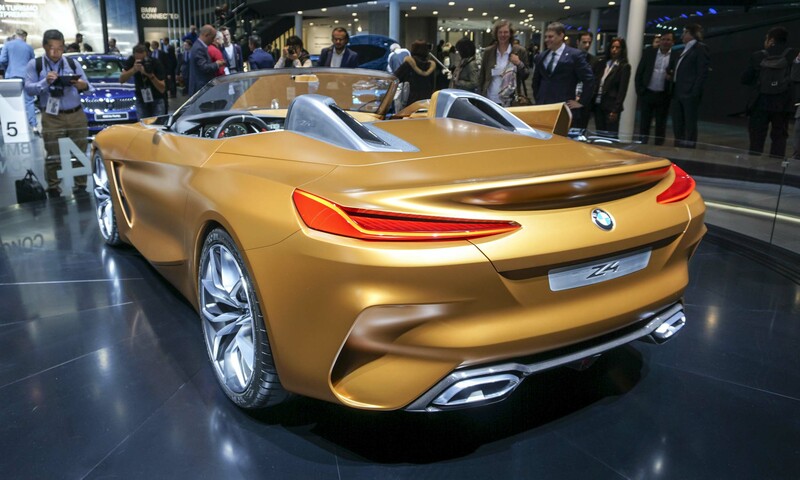 In addition, the Concept Z4 Roadster that debuted at Pebble Beach in August was on display at BMW’s Frankfurt stand. From the automaker that forged its reputation with nimble, sporty sedans comes the Concept X7 iPerformance — a full-size luxury SUV to join the top of the X line of Sport Activity Vehicles above the current X5 and X6 models. 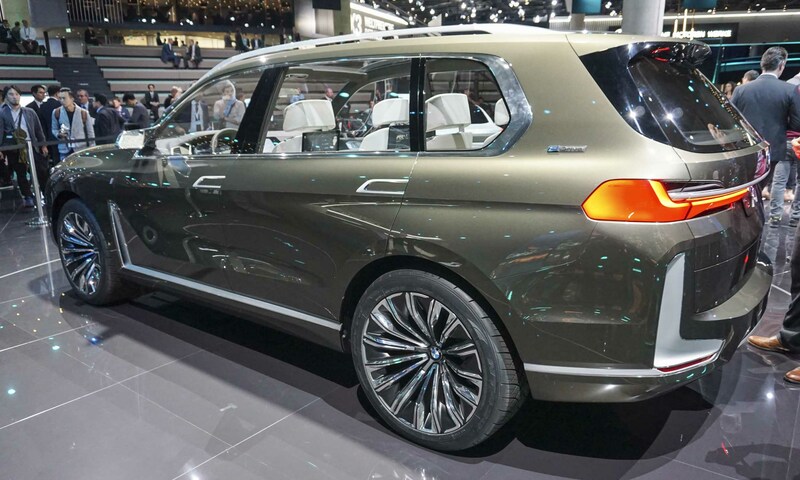 The largest SUV ever to be offered by BMW, the 6-seat Concept X7 iPerformance offers a look at the production version of the X7, which is scheduled to go on sale in 2018. The plug-in hybrid powertrain of the Concept X7 iPerformance combines a BMW TwinPower Turbo gasoline engine with electric eDrive technology. 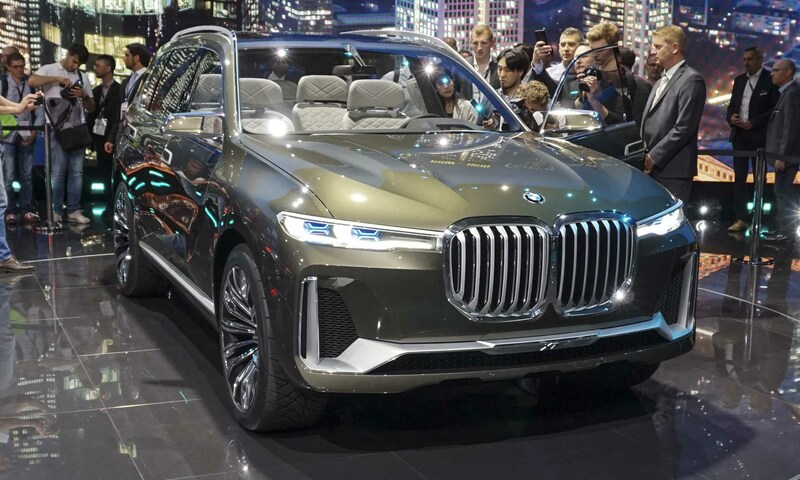 A bold new design that looks extremely close to being production ready, the Concept X7 iPerformance features a large version of the signature BMW dual-kidney grille, ultra-slim headlights and deep lower air intakes. Inside, the Concept X7 iPerformance emphasizes the amount of open space with simple forms and a panoramic roof, while luxury materials and the latest infotainment technology create an exclusive feel. Dark olive-bronze leather covers the seat bolsters with Smoke White quilted leather for the seat inserts. The instrument panel is reduced to essential information for a clean look, with a 12.3-inch instrument cluster screen and center touchscreen placed close together for a single continuous display and interactive use of both screens. 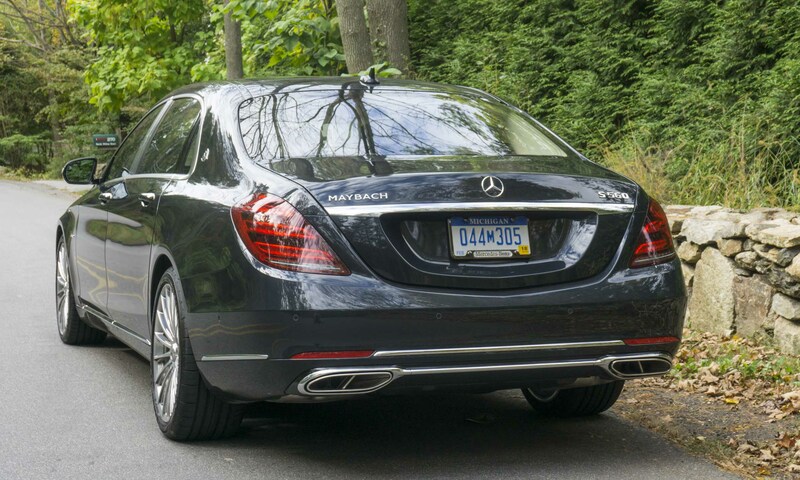 Second-row passengers control the rear-seat infotainment system with individual touch-screen monitors in the front seatbacks to access personalized entertainment or content that can be shared with other passengers or with vehicle systems such as navigation or media. 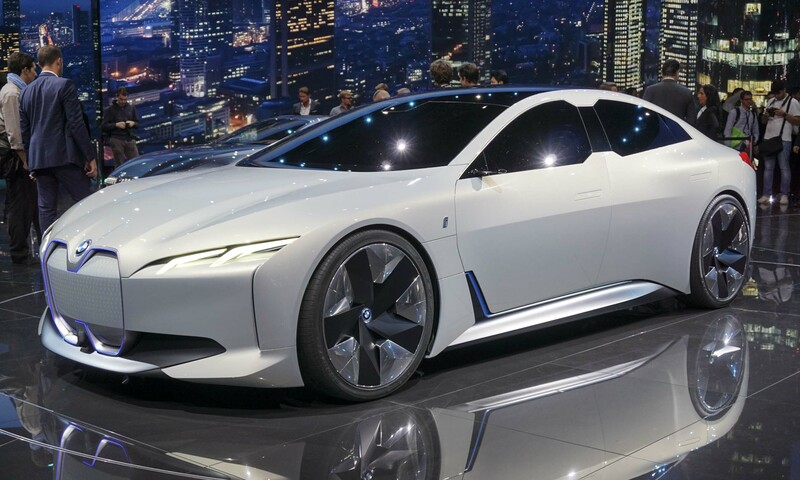 The exterior profile of the BMW i Vision Dynamics creates a new evolution of classic BMW proportions with a long wheelbase, flowing roofline and short overhangs. 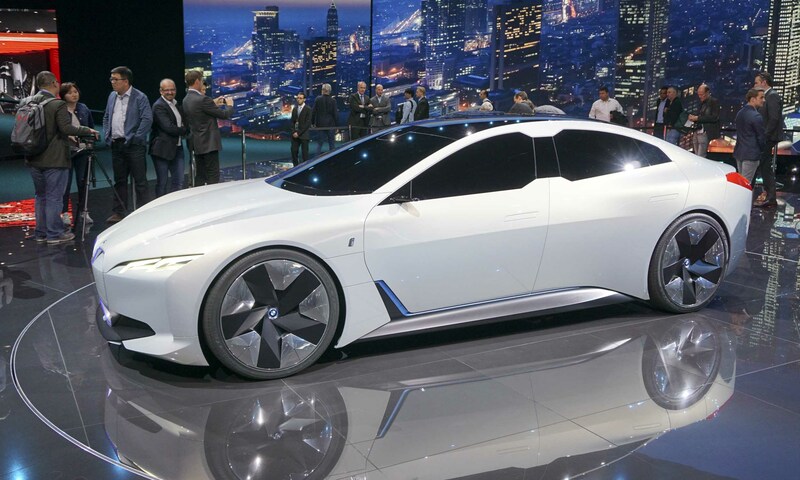 A 4-door gran coupe, the BMW i Vision Dynamics will accelerate from zero to 62 mph in 4 seconds with a range of 373 miles and a top speed of more than 120 mph. The BMW i Vision Dynamics sports BMW’s signature dual kidney grilles, but sensors turn the surface into an “intelligence surface.” The classic BMW 4-headlight system is replaced with two LED lighting elements, which includes all necessary lighting to evoke a familiar BMW look. 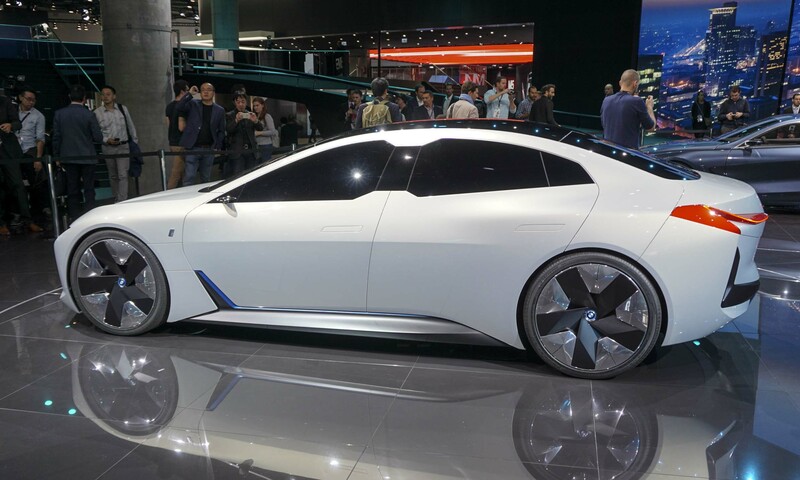 Although BMW has plans for 12 pure electric vehicles by 2025, the i Vision Dynamics concept creates the possibility of a new addition to the lineup that we could expect to see before then. BMW debuted the new 2018 i3 in Frankfurt with updated exterior styling for a wider, sportier look, as well as the i3s with its sportier chassis, wider track and higher-output electric motor and sport mode. The new i3 adds a black finish to the A-pillars and rooflines to complement the already black hood, roof and rear hatch. Full-LED headlights are now standard, LED turn indicators are added and the front and rear aprons are revised to add more emphasis to the width of the vehicle. 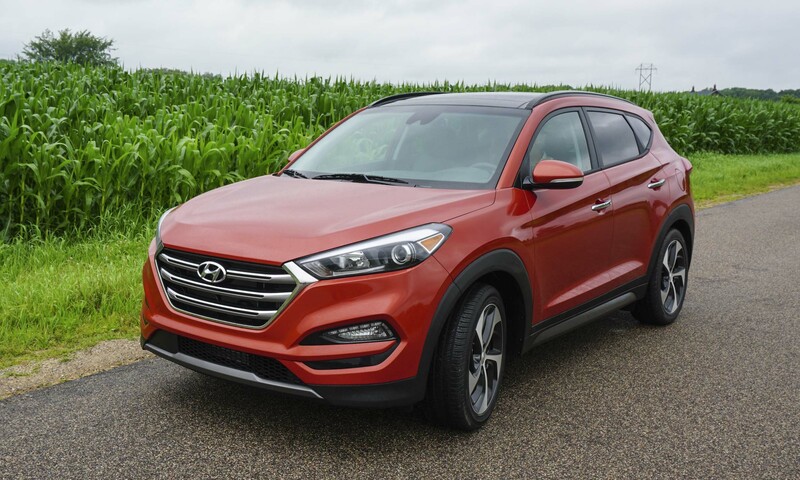 Melbourne Red Metallic and Imperial Blue Metallic are new exterior colors, and a new cloth-leather trim combination of Giga Brown Natural Leather and Carum Spice Grey Cloth is offered. 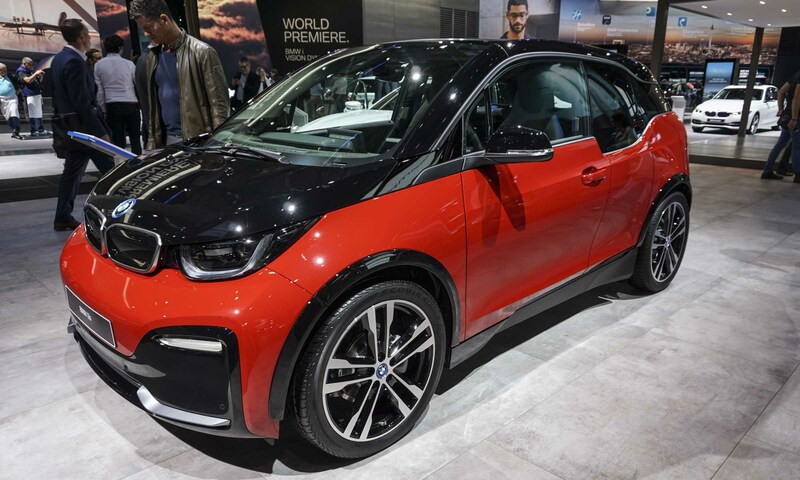 Powered by a 184-horsepower electric motor that produces peak torque of 199 lb-ft, the new BMW i3s will accelerate from zero to 60 mph in 6.8 seconds with a top speed of 100 mph. The i3s sport suspension includes specially-developed springs, dampers and anti-roll bars, and when the driver selects Sport mode the steering is more responsive and accelerator response becomes more direct. Both the i3 and i3s are available with a 2-cylinder range-extender gasoline engine that powers a generator to produce electricity for the battery when needed, increasing the overall range from 97 to 180 miles. 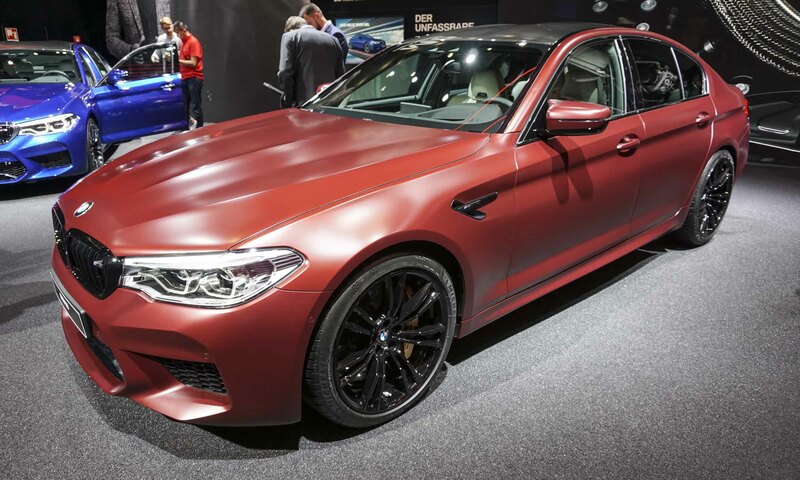 One of BMW’s most revered cars since it was first introduced in 1984, the sixth-generation 2018 M5 is the quickest and most technologically-advanced M5 ever offered. The new car will accelerate from zero to 60 mph in just 3.2 seconds and get to 124 mph in 11.1 seconds, with a top track speed of 189 mph. 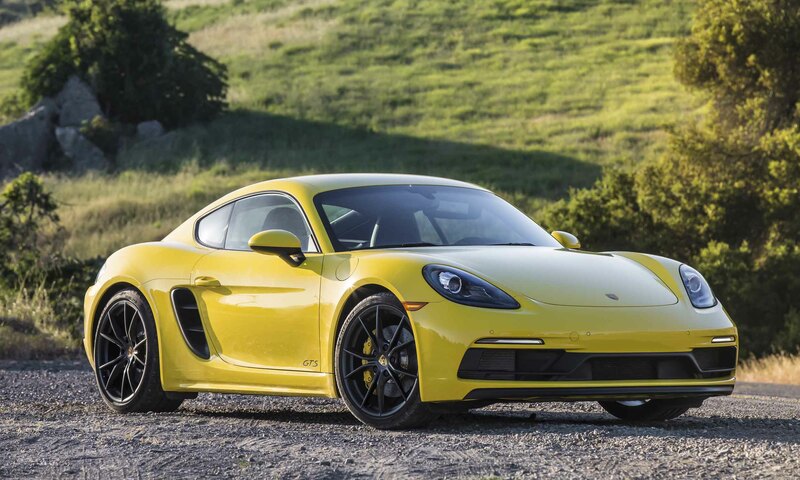 Power comes from a 4.4-liter V8 engine with M TwinPower technology, producing 600 horsepower and 553 lb-ft of torque from just 1800 rpm all the way up to 5700 rpm. All that power gets delivered to the ground through a new 8-speed M Steptronic transmission with Drivelogic and the new M xDrive all-wheel-drive system. The 2018 M5 is the first one ever offered with M xDrive, the M-specific all-wheel-drive system that offers three modes: 4WD, 4WD Sport and 2WD with no Dynamic Stability Control. When the driver first starts the car, the default mode is 4WD with DSC, which still offers some amount of slip at the rear wheels when accelerating out of corners; the driver could also choose 4WD Sport with more torque delivered to the rear wheels; or 2WD mode with no DSC, offers the same type of driving experience from the previous generation M5. Bespoke M compound brakes are standard, with optional M carbon ceramic brakes that provide a 50-pound reduction in unsprung weight. 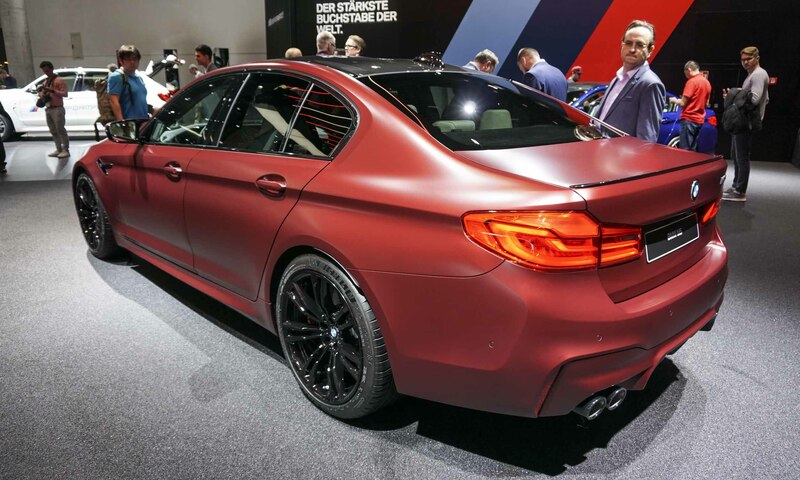 The 2018 M5 will go on sale in spring 2018; 400 M5 First Editions will be offered worldwide, with 50 available for the U.S. market. The BMW Concept Z4 is officially a concept, although the design looks very close to production for the next generation Z4 roadster. 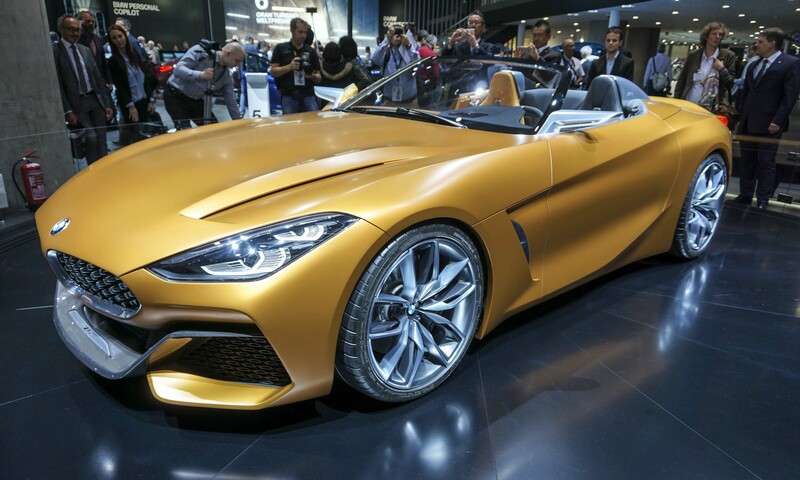 The concept Z4 made its world debut at Pebble Beach in August and was on display at the Frankfurt Auto Show. According to Senior Vice President of BMW Group Design Adrian van Hooydonk, “The concept expresses the new BMW design language from all perspectives and in all details. From the dynamic-looking front to the striking flanks to the clean-cut tail end.” The Concept Z4 features classic roadster lines with a long wheelbase, short overhangs and a compact rear end. 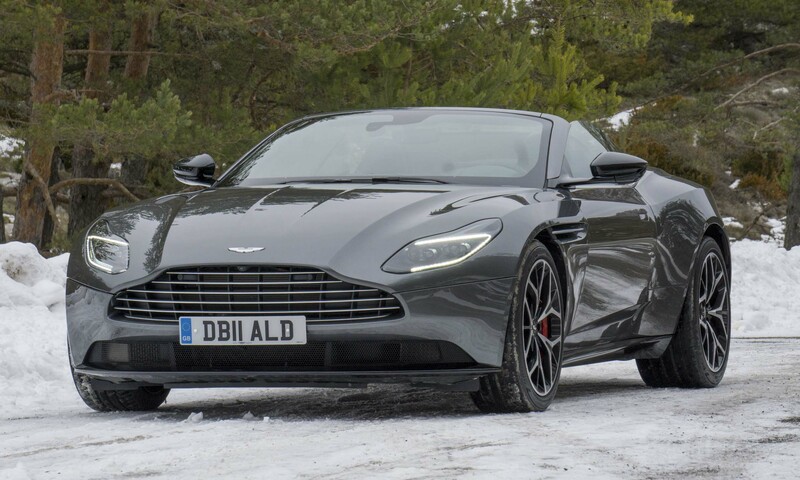 The car sits low and wide, which gives the roadster an aggressive stance and the potential for great handling. Although the Concept Z4 is recognizable as a BMW, the front end offers a new take on the classic BMW kidney grille. Headlights are completely new and arranged in a more vertical fashion, which gives the Concept Z4 “a completely new facial expression,” according to Van Hooydonk. Concept Z4 designers made the conscious choice to highlight the divide between driver and passenger. The passenger sits in a light-colored seat surrounded by matching soft surfaces, while the driver’s cockpit — which includes the center console — is black. 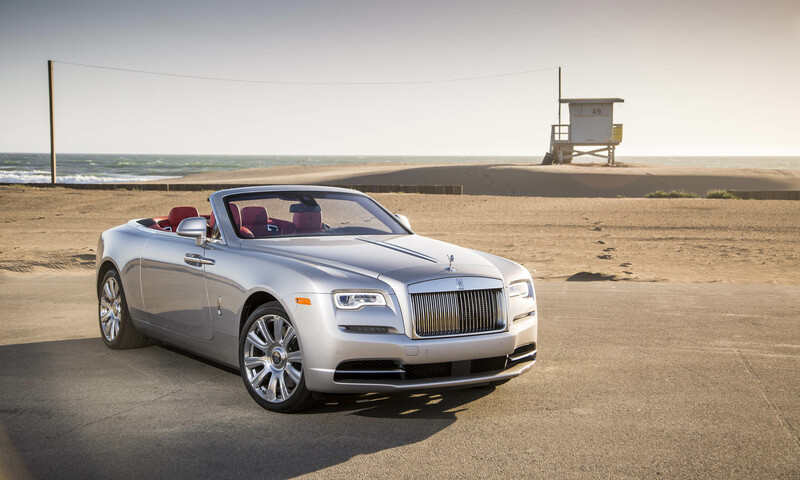 The red start button and red paddle shifters reinforce performance aspects of the concept. Controls are integrated into soft-touch selectors, and a wide touchscreen and digital gauge cluster provide information to the driver. A subtle touch: dashboard vents match the exhaust outlets.